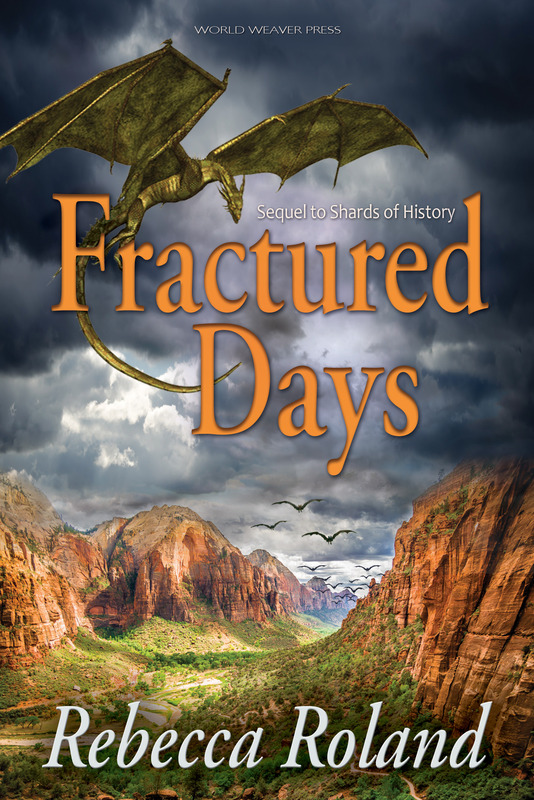 Today I welcome author Rebecca Roland, author of the just-released Fractured Days, the second book in her Shards of History series from World Weaver Press. She’s here today to talk about her love of dragons. I am one of those fantasy readers who loves dragons. I love Anne McCaffrey’s Dragonriders of Pern, I love Temeraire in Naomi Novik’s alternate history series of the same name, and you’d better believe I seriously considered dressing as Daenerys Targaryen for Halloween last year. Dragons are truly awesome. They’re huge, they’re powerful; they breathe fire for crying out loud! My first encounter with a dragon as a kid was Puff the Magic Dragon. I watched the cartoon endlessly. I knew all the lyrics to the song at one point (I tried singing it right now and after a couple of lines started humming). Puff is one of those stories about growing up and losing the magic of childhood. As a kid, those types of stories always made me sad (and they still do). It’s like losing the part of yourself that thinks of all the possibilities. Part of me saw Puff as a warning against growing up too much, if that makes any sense. I definitely believe in keeping in touch with one’s inner child. Otherwise (and pardon me for sounding a little new agey), you might lose touch of where to find the deepest joy within yourself. But I think I really fell in love with dragons when I watched The Neverending Story. Falcor was a gentle dragon, and he was furry and cuddly and enjoyed scratches behind his ears like a great big sweet dog. And when Bastian or Atreyu rode on Falcor, I felt like I was flying along with them. That has got to be one of the best advantages of having a large dragon. If you can’t smite your enemies from the air, you can fly away from them quickly. 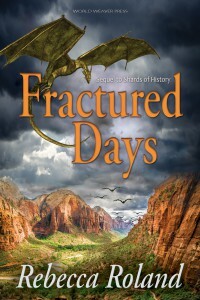 Since I love dragons so much, I had to include them in my Shards of History series. I didn’t want them to overpower the plot too much, though. As cool as dragons are, I didn’t mean for them to be the focus of the series. They are more like horses in the books. They’re mounts for the Maddion, who use the fire-breathing dragons to their full advantage, striking quickly from the air and inspiring terror in whoever they attack. The dragons can’t communicate like Temeraire, nor are they intelligent like him. If they were, the Maddions’ power would far outweigh that of my antagonists. Dragons can be beastly, beautiful, enormous, or tiny enough to ride on one’s shoulder. They can be clever or not. Perhaps they breathe fire, or maybe they spit acid instead. They might allow you to ride on their backs, or they might turn you into barbeque and then pick their teeth with your femur. Dragons demand respect and wonder. I always dreamed of having a dragon on the cover of one of my books, and that dream has, at last, come true. Rebecca is the author of the Shards of History series, The Necromancer’s Inheritance series, and The King of Ash and Bones, and Other Stories. Her short fiction has appeared in publications such as Nature, Fantastic Stories of the Imagination, Stupefying Stories, Plasma Frequency, and Every Day Fiction, and she is a graduate of the Odyssey Writing Workshop. You can find out more about her and her work at rebeccaroland.net or follow her on Twitter at @rebecca_roland. I’m flying up to Seattle tomorrow to attend Locus Weekend. I AM SO EXCITED. I get to hang out with writer buddies for a few days! It will be torture to be in Seattle for such a brief time, though. I miss that area so much. The greenery. The trees. The seasons. Sigh. I’ll have a guest post from author Rebecca Roland up tomorrow, too! She’s going to talk DRAGONS. The Clockwork Dagger is put to the Page 69 Test to see how representative that page is of the whole book. RT Book Reviews is excited about my new series Breath of Earth! It gets highlighted as a highly anticipated forthcoming release. Yay! Let’s finish up CAKE MONTH with something that’s bright, fresh, and perfect for summer! I modified this King Arthur Flour lemon cake and made it in two gift-size pans, as one was indeed given as a gift to dear family friends who came for a visit. My husband pretty well inhaled the loaf that we kept. Like last week’s chocolate cream cheese cake, this is the kind of cake that isn’t heavy duty on sweet. It’s really perfect for breakfast, brunch, or dessert. Eat it by itself or pair a slice with fruit, ice cream, or whatever else sounds good. I made this using sour cream, though the original recipe suggested yogurt or buttermilk. I bet this would be amazing with lemon yogurt. MORE LEMONY GOODNESS! 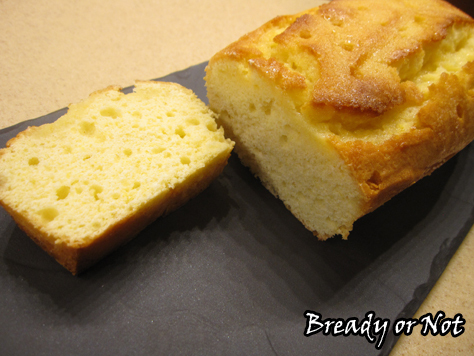 Modified from King Arthur Flour’s Lemon Bread. 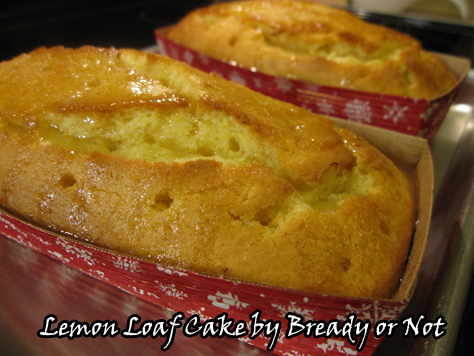 This light and fresh lemon loaf cake is perfect for breakfast, brunch or dessert. For the cake: Preheat the oven at 350-degrees. Cream together the butter and sugar till thoroughly combined, followed by the eggs. In a small bowl, mix the sour cream, yogurt or buttermilk with the lemon juice, lemon extract, and zest, and set aside. In a third bowl, prepare the flour, baking powder, and salt. 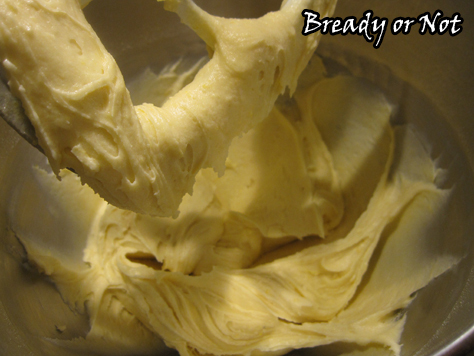 Slowly add the second and third bowls into the butter mixture until everything is together. Prepare your pan(s) by applying nonstick spray. Spoon the batter inside. 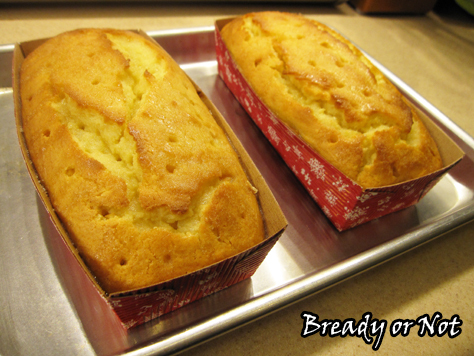 If using a standard bread pan, bake for about 50 minutes; if using two 7x2 paper pans, bake for 30-35 minutes. If using in smaller bread pans, adjust time accordingly. Use the toothpick test to check for doneness. Remove the cake from the oven, and deeply poke it all over with a chop stick or fork. For the glaze: Right before the cake is done, whisk together the glaze ingredients and stir until the sugar is dissolved. While the cake is hot, slowly drizzle the glaze over it, stopping often to let it to soak in. 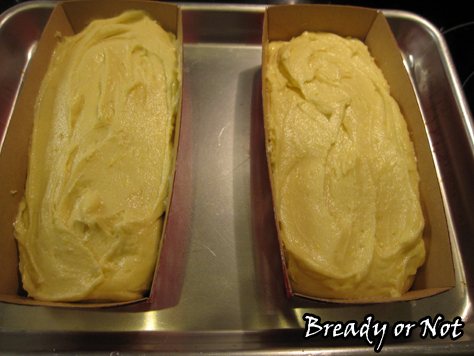 If you're using regular bread pan(s), let the cake cool in the pan another 15 minutes and then remove the loaf to let it cool completely. Let cake cool completely before slicing. Wrap it with plastic wrap and store in the fridge or at room temperature. Will keep for at least 3 days. Today I welcome T. Frohock, a fellow Harper Voyager Impulse author and a generally awesome person. 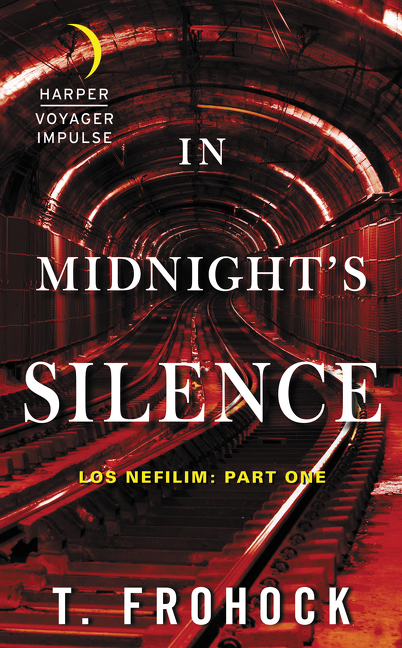 Her first novella in the Los Nefilim series is In Midnight’s Silence and it is fantastic–I happily blurbed it! Think pre-World War II Spain with angels, demons, and dark machinations. The novella is out tomorrow and it’s only 99-cents. To get you ready for a good read, here is a healthy, genuine recipe that is something her characters might enjoy. Okay, bready people, it’s time to shake off those carbs and go for the green! I have a new series coming out called Los Nefilim, which is set in Spain in the early thirties. While doing research for the novellas, I had to schedule events around mealtimes, because in Spain, lunch (usually held between 2:00 and 4:00 p.m.) is the biggest meal of the day. It is a lengthy affair with many courses whereas dinner is a lighter meal usually consisting of the kind of foods that Americans tend to associate with lunch. When Beth offered her gracious invitation for a guest post, I contacted my friend in Barcelona. Josep suggested a couple of recipes for me: spinach with raisins and pine nuts, or panellets, I chose spinach, because I have a “vintage kitchen.” That means my oven is old. I’m also a lousy baker and sweet potatoes have never appealed to me in any form. However, since this is a bready blog, I’m including a link to panellets, which are cookies or cakes made with sweet potatoes, almonds, and pine nuts. You can find a recipe for them here. The recipe I’m going to tell you about is spinach with raisins and pine nuts, mainly because we’ve got to balance out all this delicious sweet stuff with something that is good for us. I searched around online and found this recipe on Leite’s Culinaria blog. A short note here: 2 pounds of spinach looks like you’re walking out of the store with enough spinach to feed a small herd of goats. Not so. Like any other green, spinach cooks up small, so be sure you get the full 2 pounds. I measured everything out and covered the raisins in hot water in order to plump them. Give them about 30 minutes. 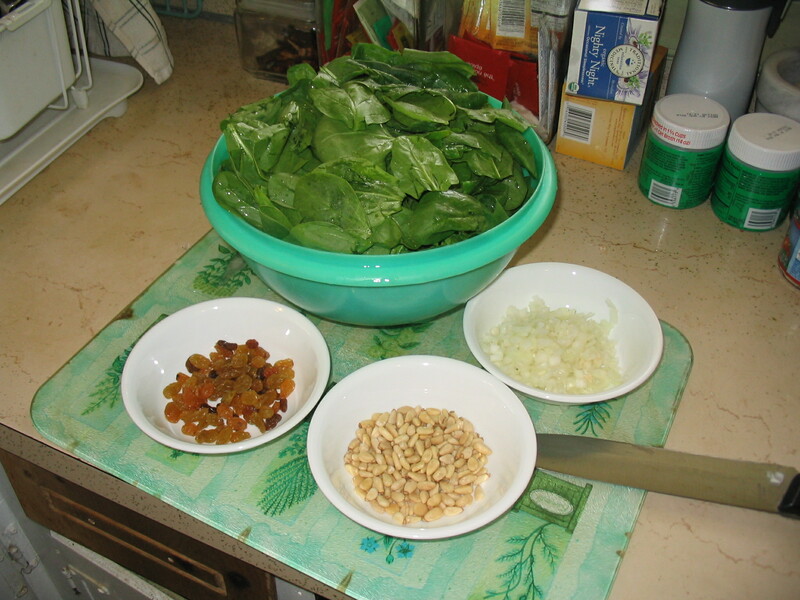 While the raisins are soaking, you want to remove the stems from the spinach. Removing the stems took me the longest, so if you’re planning on using this recipe on a weeknight, I’d recommend preparing the spinach over the weekend. Yes, you can probably use frozen, but fresh is the best. Once the stems are removed, rinse the spinach. 1. 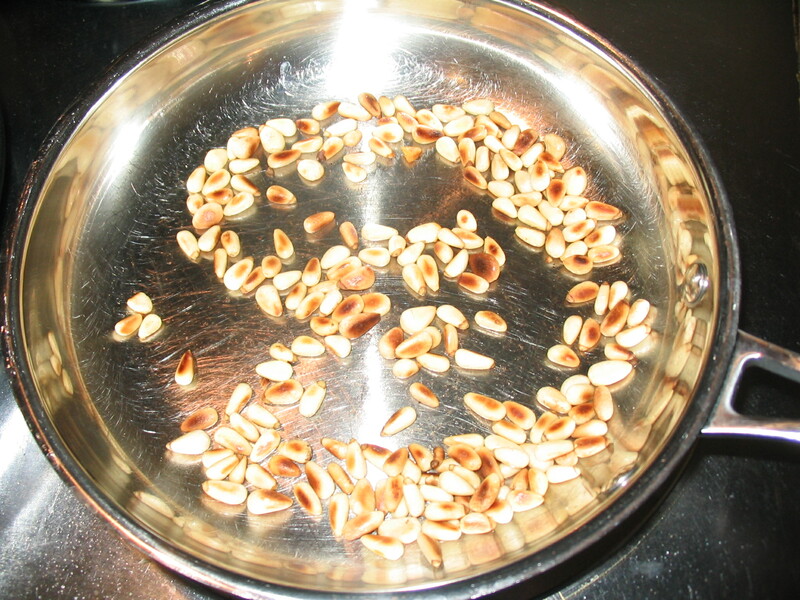 Roast the pine nuts in a small dry skillet over medium heat, shaking the pan frequently. This isn’t the time to check your Twitter feed. It only takes about 3 to 5 minutes, and once they start to brown, you can go from brown to burnt in seconds. Pour them into a plate or small bowl to cool. 2. In a large sauté pan or skillet, heat 3 tablespoons of the oil over medium heat. 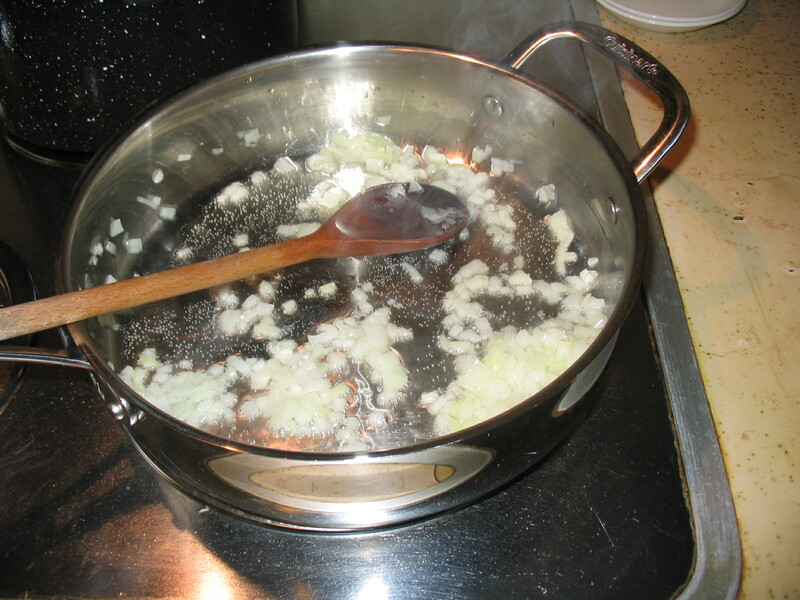 If you are using either onion or ham, add them to the oil, stirring often. The onion should be soft and translucent, and the ham lightly colored. Probably 5 to 10 minutes. 3. Add the spinach (with a little of the water still clinging to the leaves). 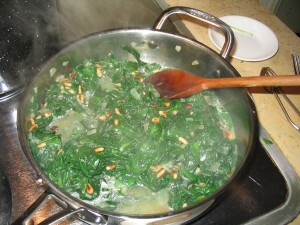 Turn and stir constantly with tongs, until the spinach is wilted and shimmering with oil, about 3 to 5 minutes. 4. Drain the raisins and add to the pan along with the pine nuts. Stir well and season with salt and pepper. Transfer to a serving dish and serve warm. The olive oil, raisins, and pine nuts take all the bitterness from the spinach and leave it with a rich flavor in addition to giving the dish a nice texture. It was positively delicious, and this from a person who hates eating vegetables. 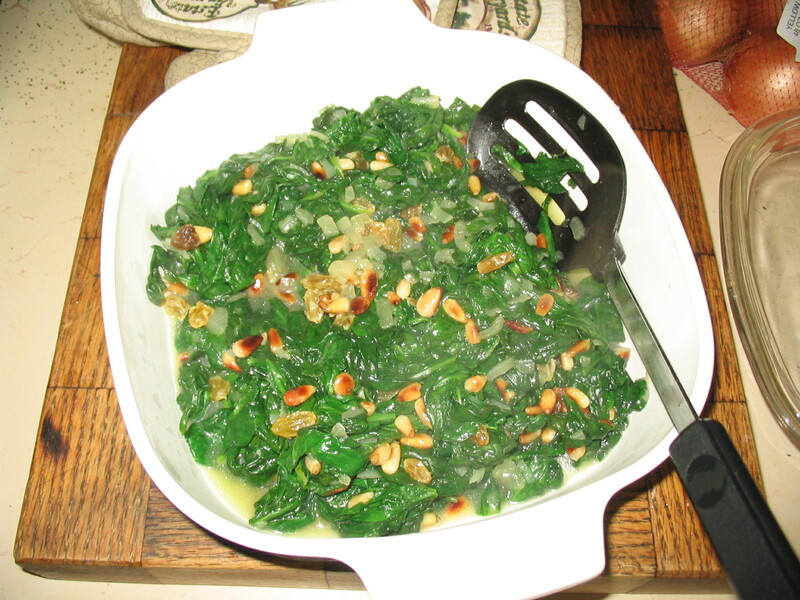 I served the spinach with raisins and pine nuts with roast pork and red potatoes, but the dish would really complement any meat. BIO: T. Frohock has turned a love of dark fantasy and horror into tales of deliciously creepy fiction. Her other publications include everything from novelettes to short stories. She is also the author of the novel, Miserere: An Autumn Tale. 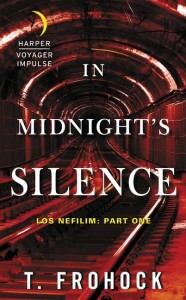 Her newest series, Los Nefilim, is coming from Harper Voyager Impulse and debuts in June 2015 with the novella, In Midnight’s Silence.